Mira Markovic, the widow of former Yugoslav president Slobodan Milosevic, has died in Russia at the age of 76. Her death was confirmed to the BBC by a close family friend, Milutin Mrkonjic. Known as the "Lady Macbeth of the Balkans", Ms Markovic was a significant political figure during the collapse of Yugoslavia in the 1990s. She was one of her husband's most trusted and influential advisers before he was arrested in 2001 but fled to Russia two years later. Mr Milosevic died in 2006 while being held at the UN war crimes tribunal in the Netherlands. He had been charged with genocide and other war crimes for his key role in the 1990s wars that tore the Balkans apart. They were married for four decades and were almost inseparable until Milosevic's extradition. While Ms Markovic owed her political influence to being his closest confidante, she also had her own political party, the neo-communist Yugoslav United Left (JUL). Prior to meeting her husband, Ms Markovic had a tormented childhood. Her mother was a Partisan fighter who was captured by the Nazis in 1942. Under torture, she apparently gave away secrets. One account suggests that after her release, her own father - Ms Markovic's grandfather - ordered the execution of his daughter for treachery. 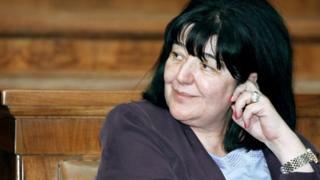 In 2003, Ms Markovic fled Serbia, where she was charged with abuse of power and was suspected of cigarette smuggling and political assassination. Markovic and Milosevic met as childhood sweethearts in Milosevic's hometown Pozarevac and married in 1965. Those who knew them often said the couple was brought together sharing tragic family histories - Milosevic's parents both committed suicide, while Markovic's mother was estranged from her husband due to political differences during the World War II. They had two children - daughter Marija and son Marko, who has lived in Russia with Markovic. Daughter Marija Milosevic was estranged from the family after her father's death in 2006 and has been living in neighbouring Montenegro. Serbian opposition parties called her "Red Witch" due to her political stance. She fled for Russia after Serbian justice began investigating a corruption case, as well as murders of journalists and political opponents. Milosevic's brother Borislav, once ambassador to Moscow, reportedly organised the move, as well as asylum for her and her son Marko.